Happy Wedding Wednesday ladies! 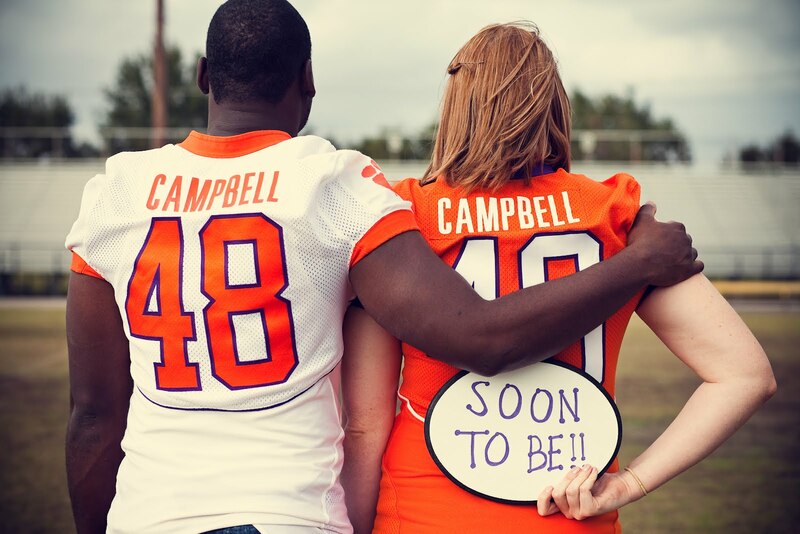 Today we have the cutest, most fun Clemson-themed engagement photos to share with you. Meet Alexandra and Jeremy. Both are Clemson alums - Alexandra a 2010 Nursing grad and Jeremy a 2010 Business Management grad. 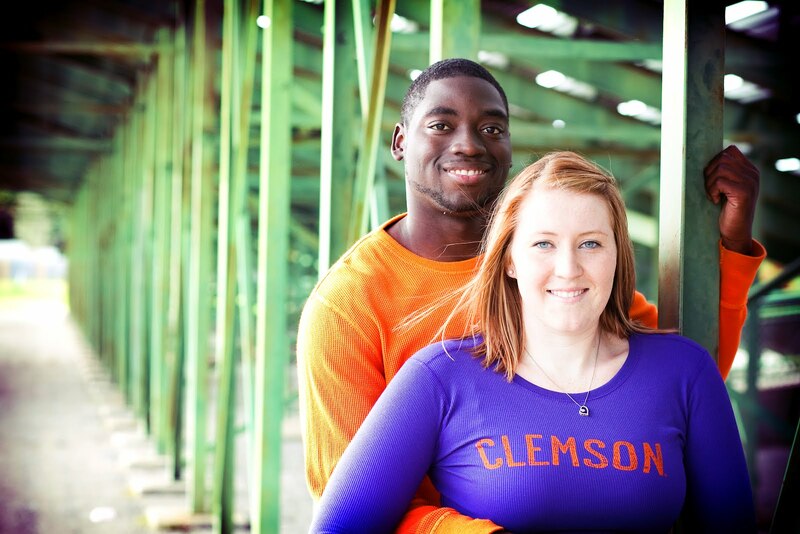 Both were also active in Clemson Athletics - Jeremy played football for Clemson and Alexandra was on the swim team. Since the two are major Clemson fans (of course! 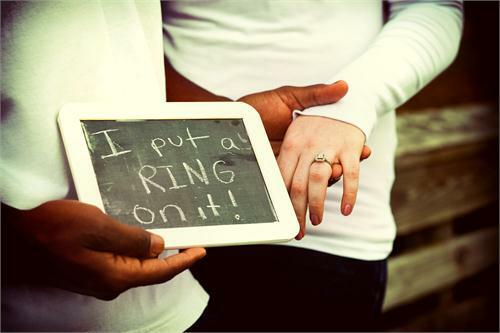 ), they decided to have some fun with their engagement pictures - the result turned out so cute! We love that Alexandra wore a Clemson jersey (one of his jerseys!) - so cute paired with jeans and boots. Alexandra and Jeremy met at a mutual friend's party in Clemson their senior year and started hanging out as friends. The friendship continued to grow and soon turned into a relationship and the greatest friendship Alexandra could have ever asked for. Now the two live in Tampa and are active in the Tampa Clemson Alumni Association. 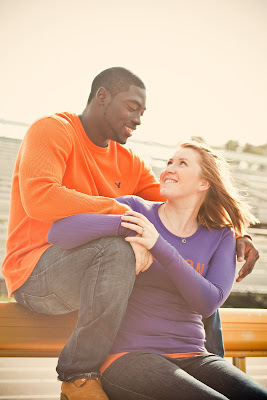 They even had a Clemson alum, Michael Costa, as their engagement photographer. The two got engaged while in New Orleans for another awesome Clemson wedding. Jeremy had planned a fancy dinner on Bourbon Street where he proposed. Alexandra says he was so nervous and that "it was too cute!". After Alexandra said "YES! ", they got to go out and celebrate with all of their friends. The wedding will be in Clemson, September 1 of this year. Alexandra says, "Don't worry, the football game will be on during the reception!". And to continue the Clemson-theme, the wedding colors will be orange and purple! He's wearing HER swim cap.... she's wearing HIS helmet. Lol! Cute! Thanks so much to Alexandra and Jeremy for sharing their Clemson-themed engagement photos and their super sweet love story with us today. These two are such a cute couple (I'm pretty sure I've said 'cute' a hundred times in this post) and we wish them all the best with their wedding and marriage!